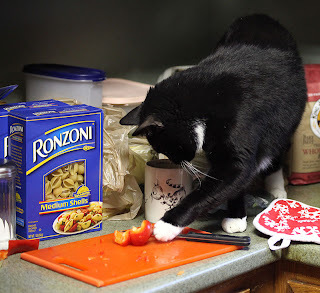 Quilting and Cooking with Moki! Newest Blocks for my Angel Quilt! Moki and a Mini Quilt! We got a snowstorm today, now it is raining, so it is all melting. The birds seem to love snow and rain and they were all out today, so I tried to get some snow shots. Unfortunately, the snow left blurry dots all over the photos, lol. 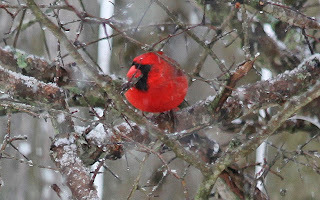 Mr. Red was visiting as usual, he always comes when I got outside. I think the birds know that when I am out, there is food. I took a few days break to wind down and rest my sore fingers, tomorrow it is back to my projects. I finally finished the quilt yesterday. There are things I wished I had done differently and things I could change, but I needed to stop, so I can get it out. 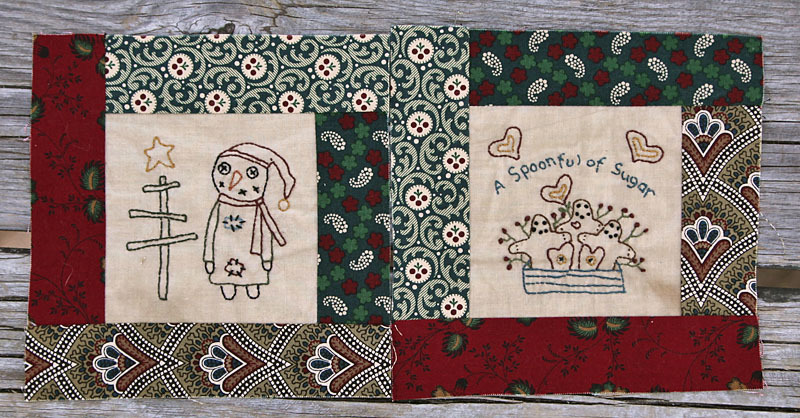 If I was making it for me, I would have done more quilting and taken the time to do the blocks, but I also want it to be soft so she can use it, so less stitching is better for this one. 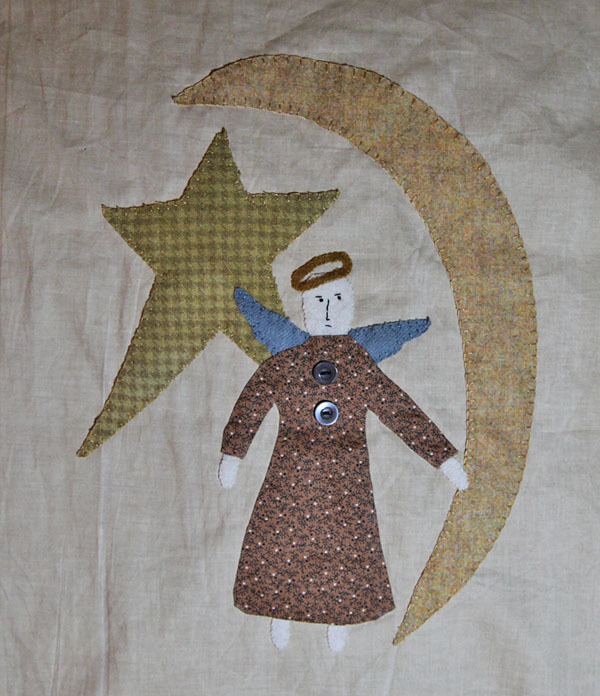 I added some extra stitching around the hearts and some swirls coming out and then added a saying and words to the angel and moon block. Hopefully she will like it and it will comfort her when she goes through the tough days ahead. 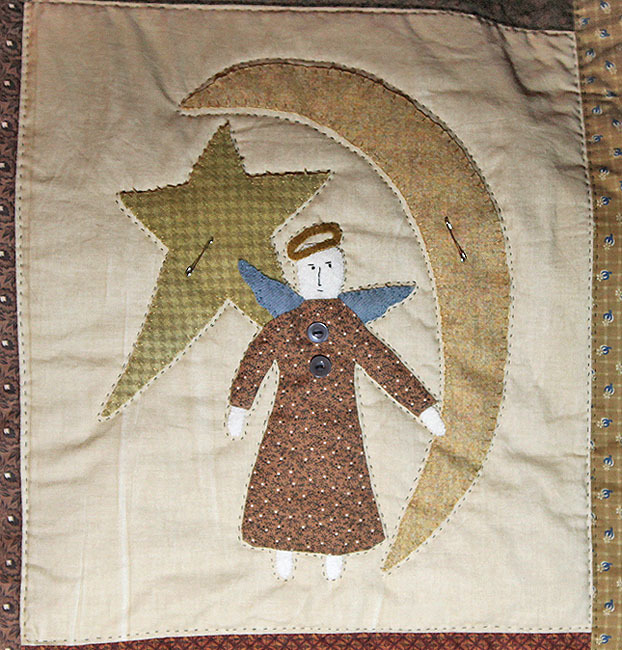 The quilt was adapted from a pattern in the Angels book by Jan Patek. I tried different lighting with the flash, but it didn't work as well, since I had to stand back to get it all. I also hand stitched tan around the inner black border, but for some reason it isn't enlarging when I click on the photo? My sweet Casey is not himself lately. He has lost most of his hearing and he loves it when I talk to him and understands the important words like Out and Go for walk and now he just stares at me and looks like he is trying to read my lips. He is also sick, low protein and kidney problems, so he is on a special diet and aspirin so he doesn't throw a clot. 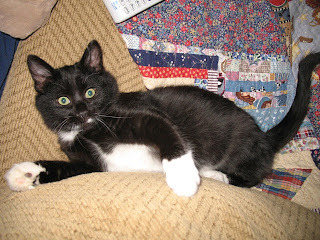 Sadly our pets get older and since he has lyme too, he has problems caused by that. But he is a happy dog and he gets lots of love and likes to sit on the porch with me and watch the birds. 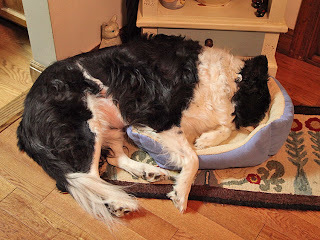 For some reason, after I washed the cat bed and put it upstairs, he thinks it is for him. No flash, so a bit yellow. Today we went to best buy, I had free money, so I finally got myself a flash for my camera. It is small and lightweight and does the job without the high cost, so very happy with my purchase. I had to hit savers while I was up there and found this wonderful fabric. 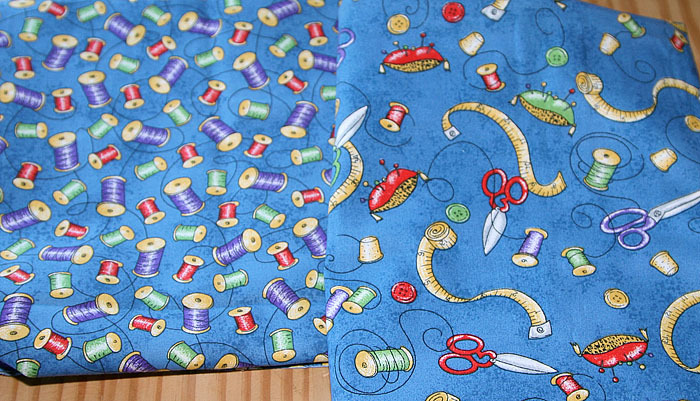 A yard each at 1.99, so a good deal for fun fabric to make some sewing items with. This I took with the new flash. It is so nice to get truer colors. Today it was gusting like crazy, so good day for a drive and shopping. I still don't drive myself, since I still get spells, but I love to get out when Bill has the weekend off and we can go to my favorite quilt store. 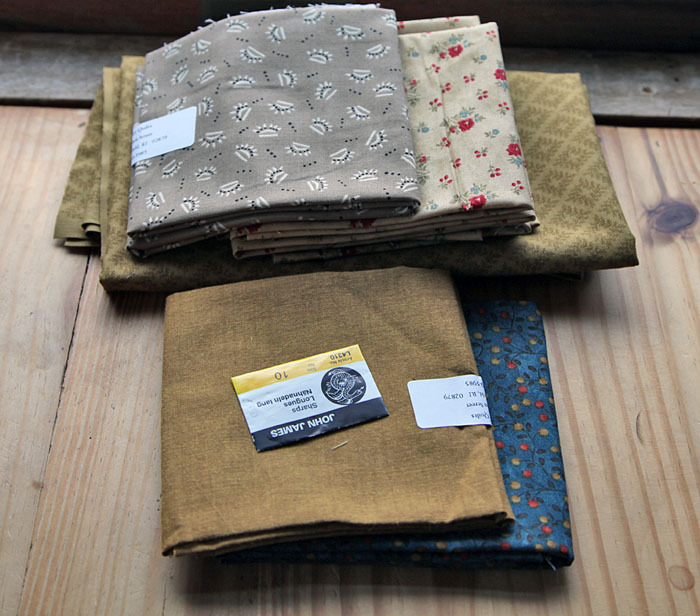 I really need some filler fabrics in green and prim yellow/golds, but can never find what I want. I was able to get a nice light gold and found some extra fat quarters that would be fun to work with. 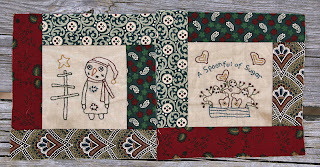 Once I finish my sister's quilt, I need to start on some blocks for Lynda Hall's Block Party. 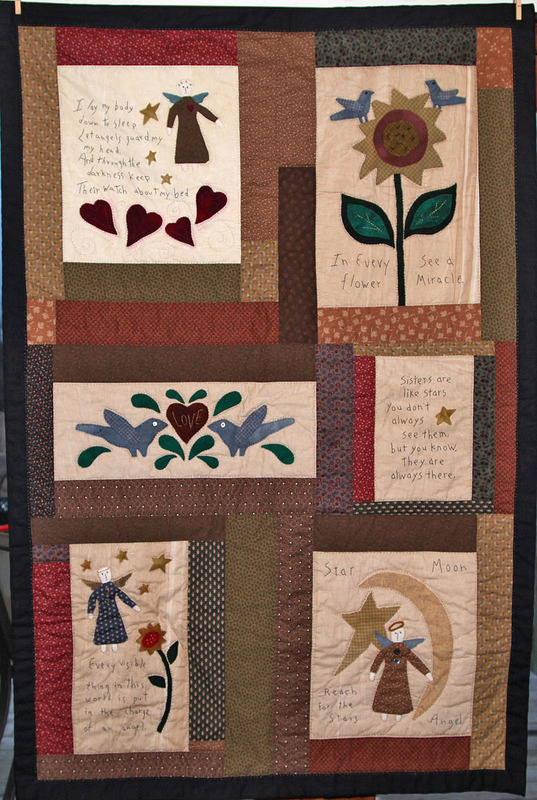 The blocks will be made into a quilt, for Quilts for a Cause and will be auctioned off. I got the tan with red flowers to go into that. If you go to Lynda's blog, you can learn about her back door friends and sign up for her birthday giveaways. Another fun thing about going to the south end, is the ocean. The first stop was Galilee to see if the ferry was coming in, but it wasn't. 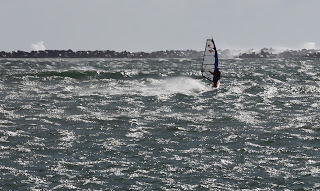 But, we did get to watch some wind surfers braving the waves and wind in the channel. 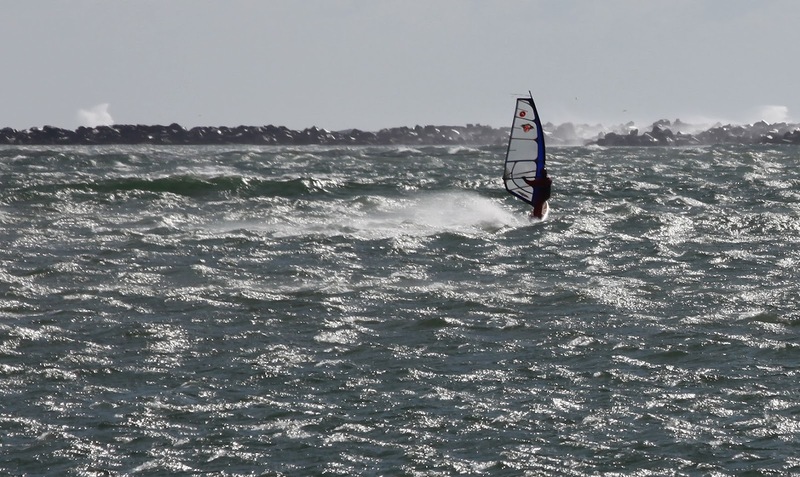 The wind was wicked and that is not an exaggeration. We went to the light house at Point Judith next. I went to open my door and it flew open and slammed into the car next to us, ugh. 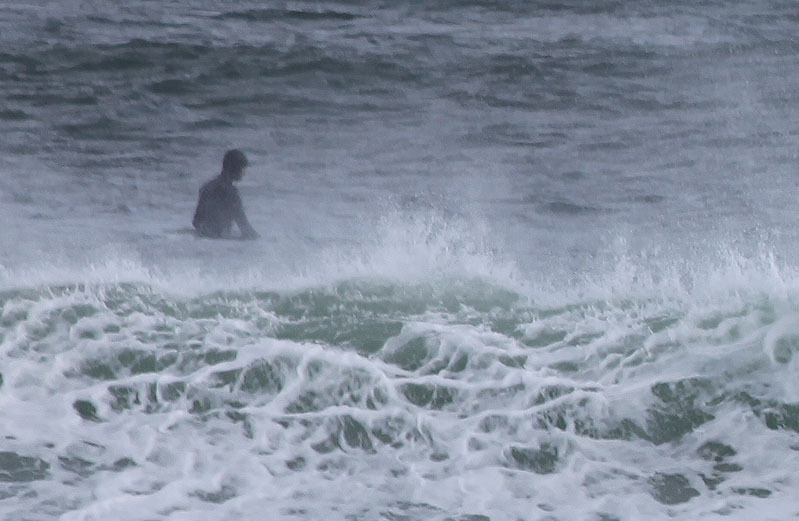 The surfer was just coming out and we told him what happened and he said it was no big deal. Did I mention it was a BMW, lol. 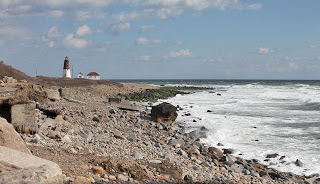 There were a lot of surfers by the lighthouse, but with the rocks, it is not the best place to surf. 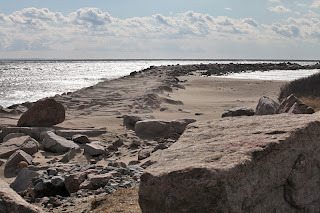 Then we went back to the breakers and half the road was gone. 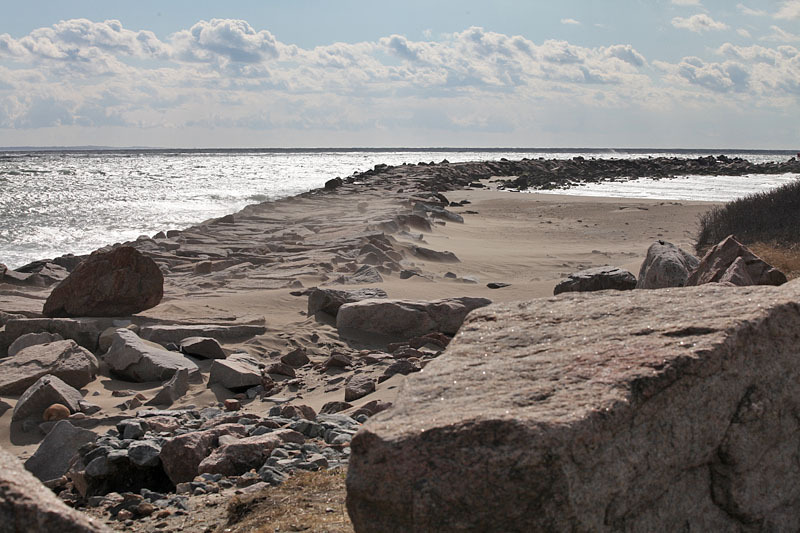 It seems the winter has eroded a lot of the beach area and the road is starting to go with it. 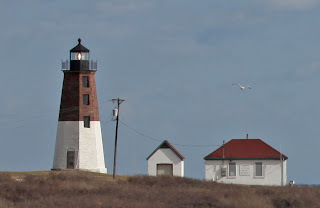 I always enjoy seeing the lighthouse, something I love about New England. And a closer look, the gulls were flying into the wind so I was able to catch one with this shot, since they were't moving too fast. I hope you all have a wonderful weekend. I had a bad day for sewing, so had to take a break, hopefully I can finish the quilt tomorrow. 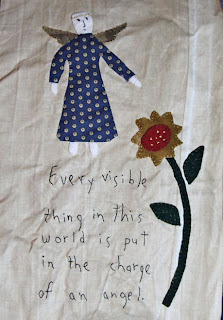 I finally finished all of the outline stitchings in the blocks and strips and now I am stitching around the appliqués. I decided it needed it and as you can see on this piece, it needs something else in the empty spaces? I was thinking of adding some scattered words, of encouragement? It is not as cockeyed as it looks, it is lying on the couch.Yes, I forgot to take out the pins. I used iron on batting, but added some pins to the middle of the block to keep it from shifting. 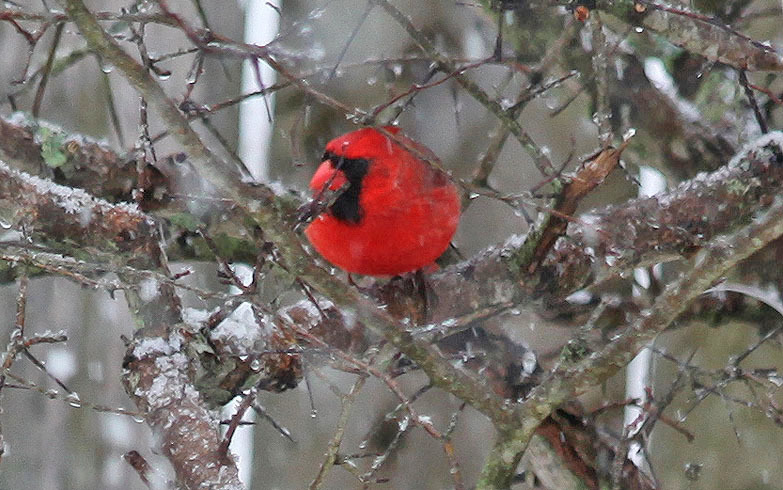 And this is my red buddy, he knows I want to take a nice photo of him and he sits on the branches and looks at me, all the time, but the minute I get the camera out, he hides. I guess he is camera shy. Two new visitors came today. 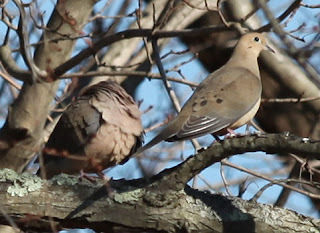 They were shy too, but I was able to get a shot of them while they rested in the neighbor's tree. 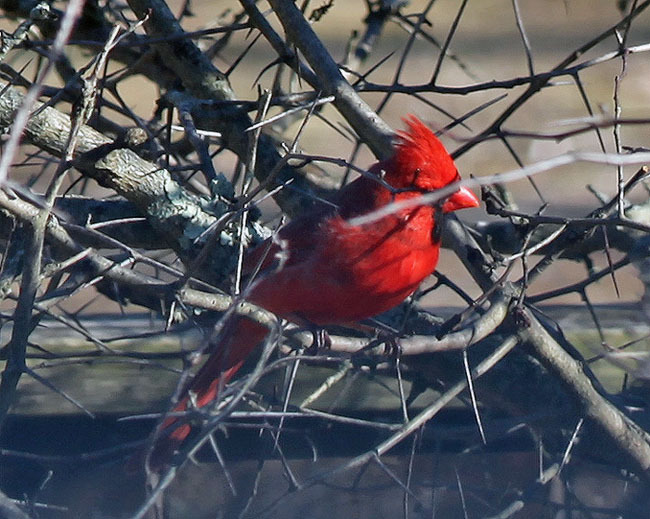 With the warmer weather, it seems our area is filled with birds and today it was a cacophony of songs. I am still sewing, and my fingers are killing me. 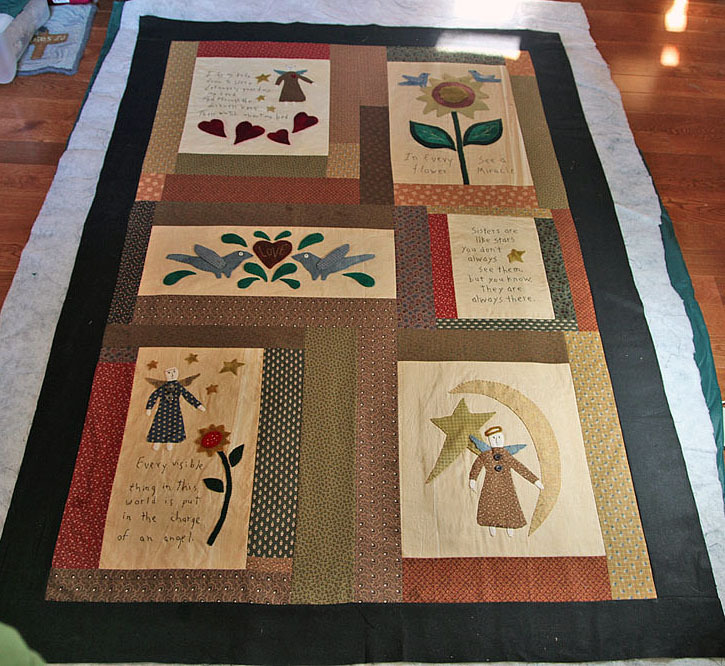 Hand quilting is fun to do, but not when you are in a hurry and sewing for hours and hours, but I am near the end of the quilt and then some stitching and fixes in the blocks and I will be finished. Hopefully I can get the stitching done and show you a photo tomorrow. 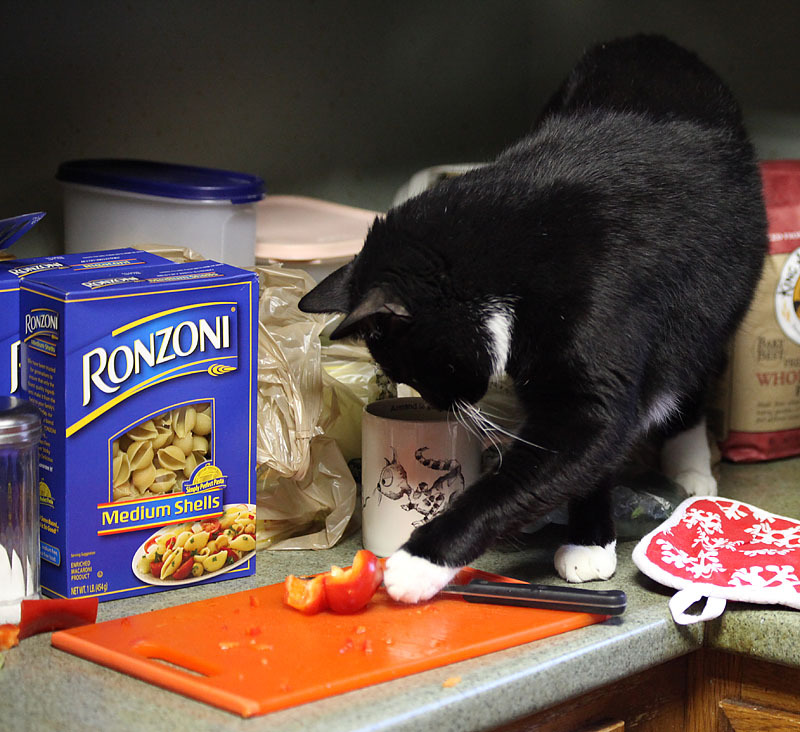 I received this cute photo in the mail, from my friend Kay MacKenzie. I was fortunate to win one of her contests for a book and another where I won Kay's appliqué book, so more new projects that I will be doing this year. She got a new kitty and he looks just like Moki, he is so cute and I can't wait to see how he looks as he gets older. Today I finished the quilt top and made my quilt sandwich for quilting. I added a new block with a sisters saying which I found as a friend saying and changed the one word. I added some strips, cut a little here and there and fit them all together. It measures 68" x 47" with the border/binding. When I finish the quilting I will fold the border to the back to use as the binding. I decided to do this the easy way and used fusible batting, a bit stiff but I wanted to put it together without pins, though I did add a few just to stabilize it better. My plan was to do black running stitches on the inside of the quilt blocks, but I need to decide how to quilt the rest? I left some things undone, so I can do that stitching with the batting in, to give it more depth and more areas that are tacked down. My sister is still waiting for a time to have her mastectomy which is the next step, so I have time to quilt it before she goes in and comes home. I will start quilting tomorrow, so any ideas or suggestions are always appreciated. I had to take a photo in a darker room, but once I quilt it, I can take a straight shot and hopefully show all the detail. 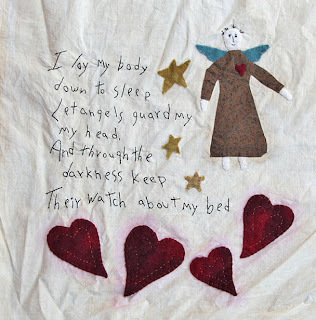 The appliqués are from pattern books by Jan Patek; Angels and Say it with flowers, and a few of my own touches. I guess there is no escaping the cold that is going around, do not need to be sick right now. I got some more of my quilt done, though not as much as I would like, but it will get done. I made this sunflower block, since my sister likes sunflowers and added a saying. I think it needs something in the upper part, but not sure what, maybe a few words like hope, strength? Not a great color shot, bad light tonight and I am too miserable to try too hard;) This block was from a book by Jan Patek, called Say it with Flowers. 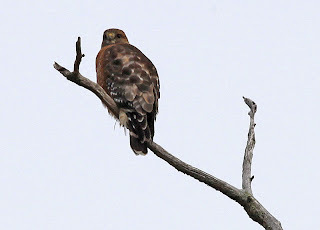 Yesterday, the hawk was visiting. 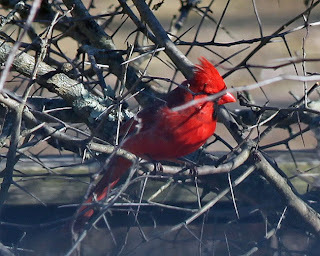 He perches on the tall tree in the back of my yard and watches the field below. Lots of field mice to keep him satisfied. As far as my first block goes, I did use a Chlorox bleach pen on it. I went near the hearts and rubbed it in with a paper towel. It did work, the stain was gone, but once I rinsed it out, it came back, lol. This time is was lighter, so I might leave it and stitch around the hearts. The next block I used was from Emily's quilt, I wanted another large block and this one was fun to do since I used wool, which makes it easier and faster to sew. 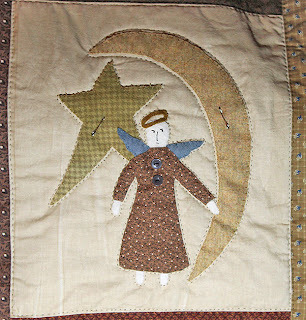 This block is from the quilt on the back of the Angels book. It is a larger quilt with all types of designs on it, but this one was a saying, I just had to add to my sister's quilt. The sunflower, I took from a small drawing on another book of Jan's. My last block today, I made from a pattern in the book, Say it with Flowers. 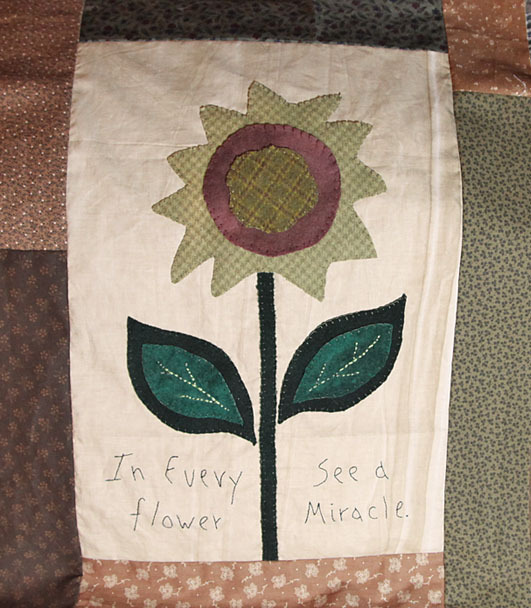 I also used this book for the sunflower shown above and the next block I am working on, which is a large sunflower. I think I need some green scroll leaves beneath the heart. Once I finish the sunflower tonight, I will add sashing, then decide where and what types of blocks I can add to finish the size I want. I should know better than to rush or think too much with my brain, lol. I came up with an idea, use Jan pateks Emily angel quilt for the base of my quilt, just using some of the blocks and some filler blocks. I made the first block and had room to add more and I figure, a bigger block, the faster I can make the quilt for my sister. But, I forgot what happened the last time I used red wool on tea stained fabric. Soooo.... now I have red shadows around the hearts. One idea is to use spot remover or something that takes out stains or add stitching around the heart area to mask the pink. Or I can make something else that covers those spots and take the hearts off, or cut really close to the words and chop it off there, so if any red is left, it will be in the border with the sashing. I took this shot of moki, doing what Moki loves best, hanging out in his cat tree. I put it next to the window and he sleeps there now and a perfect place to look out the back door and watch the world. I have had a slow weekend, but I finally finished two more angels. Someone said they would like to see the wings in neutrals, so I used some tan prints for these. They are fun to do and will make great gifts and thin enough to fit in a card. The pattern is from Bird Brain Designs. Be sure to visit, she is hosting a giveaway. And now to the winner of the giveaway...... The random generator picked # 1, so yes, being first can be a good thing sometimes;) The winner is Patty of Pieces of My Life! 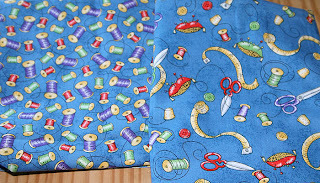 Patty, email me with your choice of a pattern from my ecrater site, Congratulations! I received my last two prizes today and so thrilled with how wonderful they are. I haven't had any time to decorate and it is so nice to have the new items to bring some love to my house. 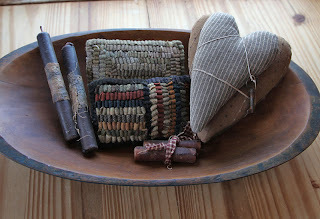 These gifts were all part of a giveaway hosted by Primitive Handmades Mercantile. Robin of Bird in the Hand Primitives sent me the most wonderful prim doll. 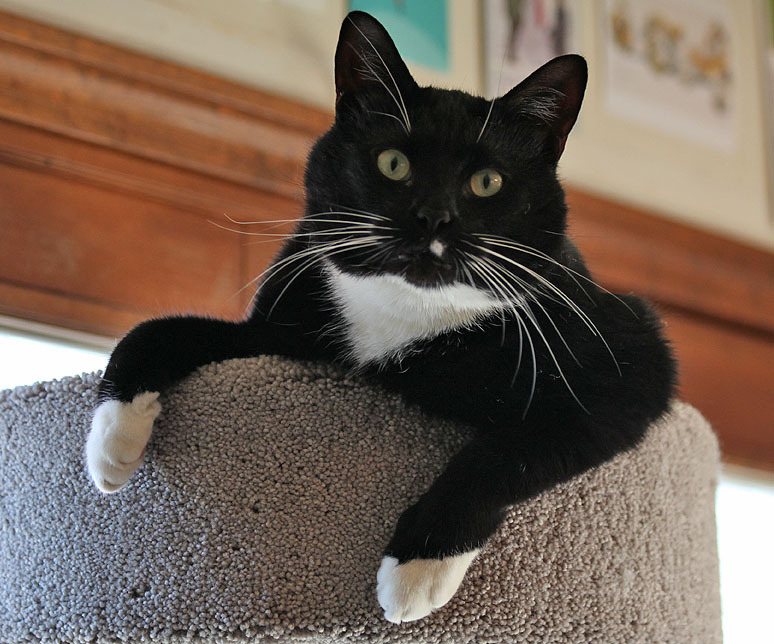 Of course prim does not show well in photos, but hopefully you can see how wonderful she is. 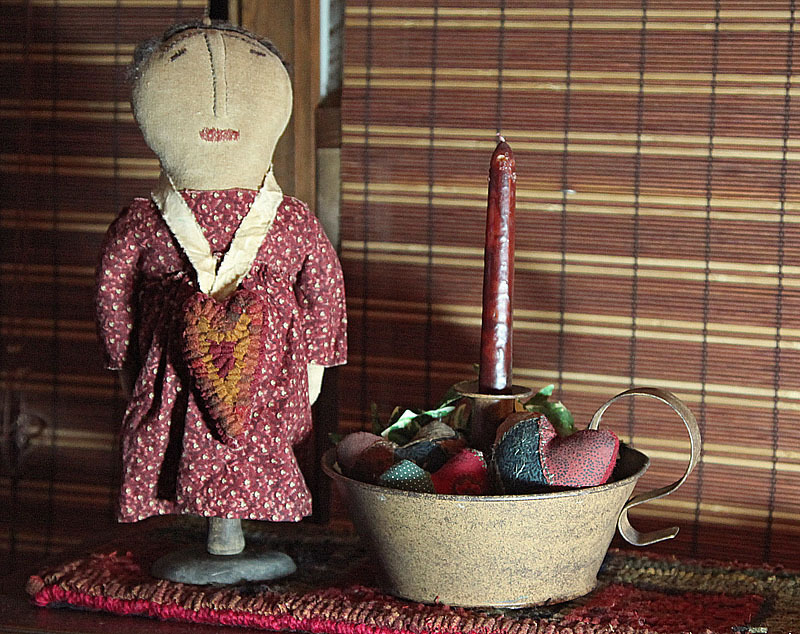 The fabrics are all aged, and she is placed on a rusty spindle. I placed her on my apothecary next to my chair, so I can admire her. Robin really puts a lot of detail into her primes. It is those details, a worn spot, vintage fabrics and the hand stitching on the face that make a true prim so wonderful. She even has a hand hooked heart necklace. I just love her, I think she will stay out all year;) Be sure to visit Robin's blog, she has wonderful free doodles and a new one today. The last gift I received was from Margie of Hungry Hook Primitives. 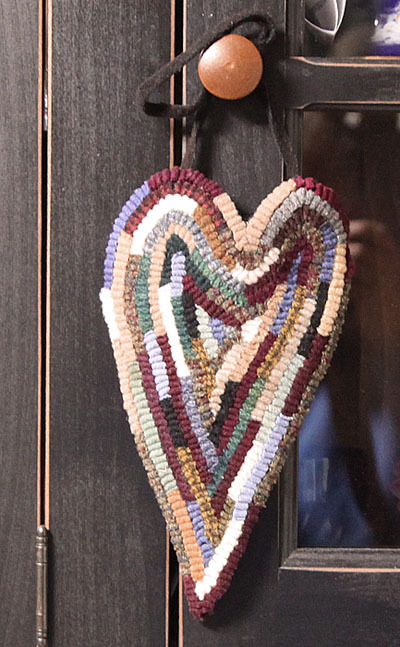 It is a beautiful hand hooked heart, made with a variety of beautiful wools. Of course I can never get the true look on hooked pieces, I think the camera gets confused with all of the dyed wools, but I think I got it pretty close with a little photoshop magic. It is just so beautifully hooked and gorgeous wool shades. I feel truly blessed to have been the winner of so many wonderful gifts and with the bad month I have had it really brightens up my day to see them in my home. 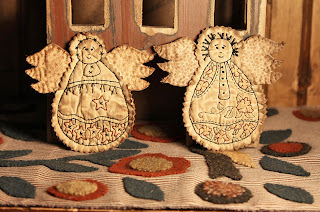 I have been working on some more angels, trying tan prints, this time. I am starting to feel better again, so hopefully I can get back to finishing my projects and maybe do up some new freebies. I have also been practicing with my good camera, just automatic for now, just to get the feel of the camera, it is heavier than my old one. 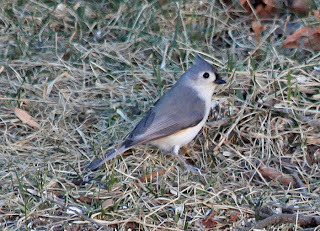 I also got a zoom, but not sure if I got the right one, my photos seem to come out too fuzzy, but it takes really nice macro shots of items that are in a certain range. So, here are a few shots that I took, and had to enhance in photoshop. 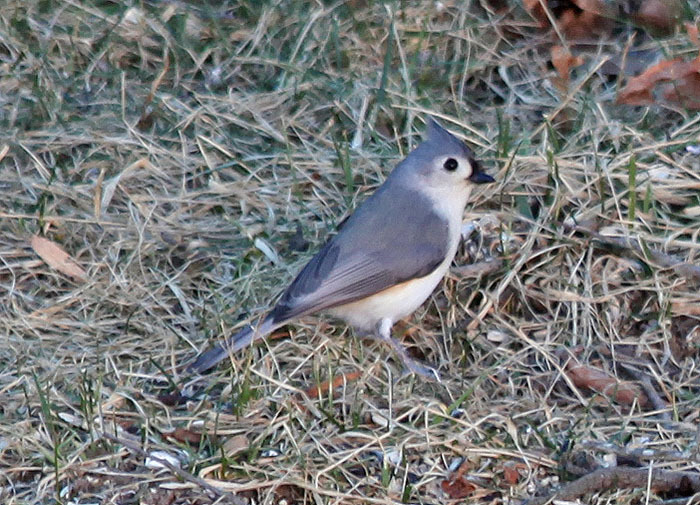 I really wanted to get a nice crisp shot of the bird, and wondering if all those focus points are messing me up, maybe I need to adjust them. What kind of bird is this? A type of Bluejay? We have a bluejay that visits and he is a lot bigger than this little guy. And here is an edited photo. 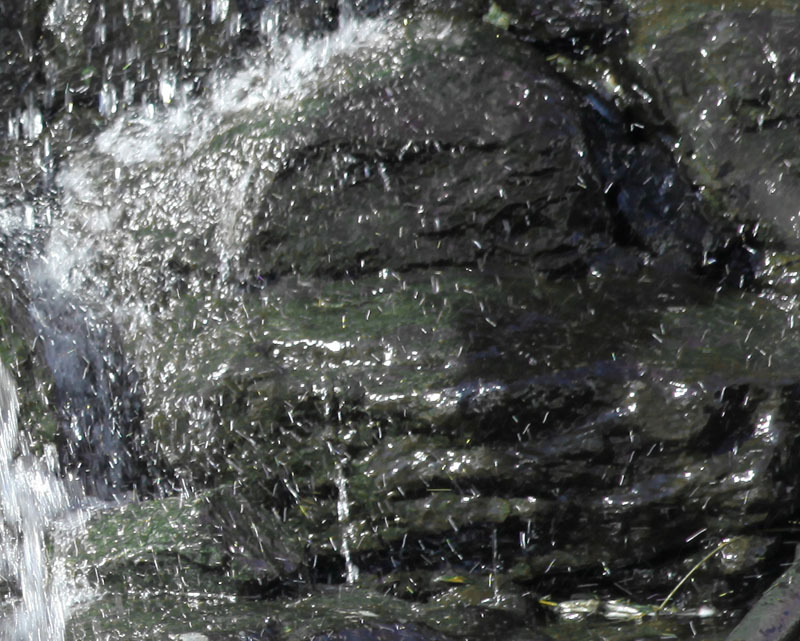 I was taking a shot of the pond, from the falls and the cropped shots of the falls, had some interesting details. I used a filter on this one, it is the water falling off of the rocks, do you see something in this picture? Leave a comment about anything from this blog and you will be entered to win a free epattern from my ecrater site. The giveaway is open until Sunday at midnight and I will announce the winner on Monday night. Last week, I found out I was the winner of the giveaway hosted by Primitive Handmades Mercantile. They are a new group of primitive artists who sell on a monthly basis. I hope you visit their site and check out the talented artists, maybe find a gift for yourself or a a friend. I received three prizes so far, two more are on their way. I haven't had much time to make myself too much for valentines, so it was wonderful to win this giveaway and have such treasures to display. I received these three hearts from Susan of Olde Threads. They came in a beautiful package, and have a wonderful prim smell to them. A picture just doesn't do these justice, they are filled with sawdust and the fabrics are wonderfully aged to perfection. 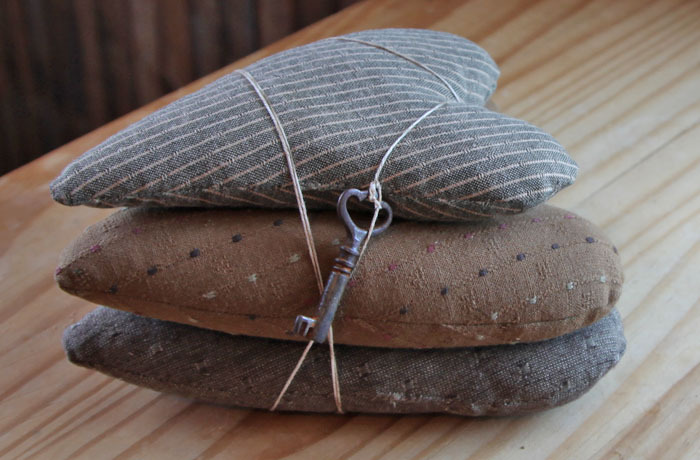 I love the way she bundled them and added a key, makes a wonderful grouping. The second prize I received was two hand hooked pillows, made by Kathy of Woolfind's Keepsakes. They are in a hit or miss style, but she blended the colors so beautifully, a perfect match to go with any grouping I have, so something I can use all year round, just love them. 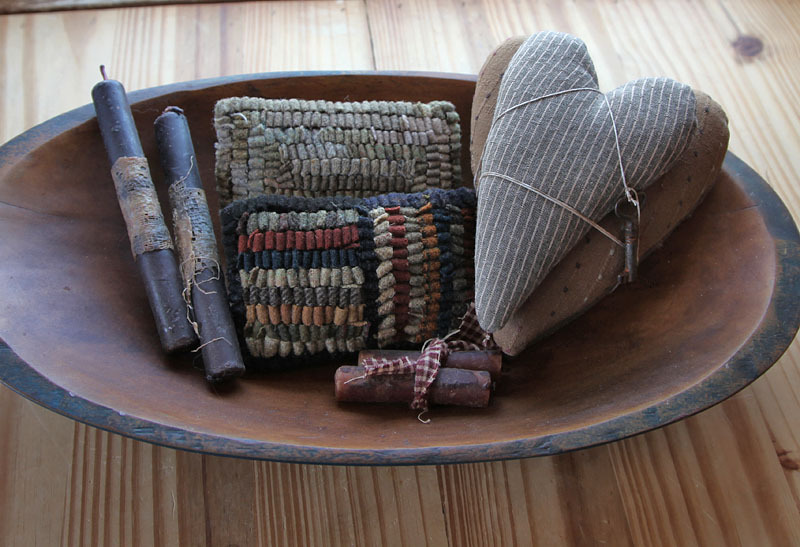 And third, but not least is a set of three primitive hearts. These were made by Teresa of Teresa's Prim Treasures. 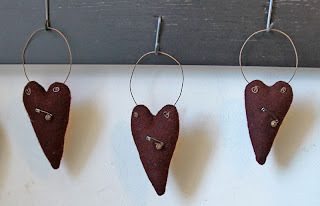 They are a deep red and with the added rusty bell and pin, they are perfect for a prim valentine. I love the way she uses the wire to hang them, they are perfect for hanging on my racks.